High quality innovative products and a very high standard of service for demanding customers – that is what Weinor excels at. While many competitors speak of quality, Weinor provides it, and we do so with conviction and passion. Our technicians and engineers are quality enthusiasts with ever little part being rigorously tested to exceed our extremely high expectations. Weinor go so far as to even test the fire proof nature of the uniform work-wear our staff wear in our factories in Germany. As you can see, no stone is left unturned in providing you the best quality awning and retractable roof solutions. The behaviour of patio owners has changed in the course of time with the increase in Alfresco lifestyle. The patio area wants to be used all year round, not just when the summer sun is beating down. Weinor’s product range is designed to meet this requirement, as the business is specialised on complete solutions: You are able to obtain everything from a single supplier and therefore you have the ability to design the ultimate outdoor room to meet your lifestyle demands with products all from Weinor. Be it sun protection in form of a retractable awning, or in form of retractable patio roofs and or conservator awnings – whatever your requirement, Weinor Australia has the solution. 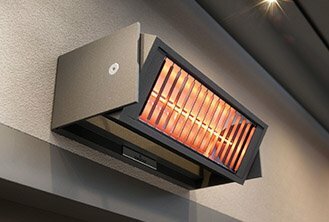 When equipped with additional options, such as heating and light, the products turn into lifestyle products with year-round-function.